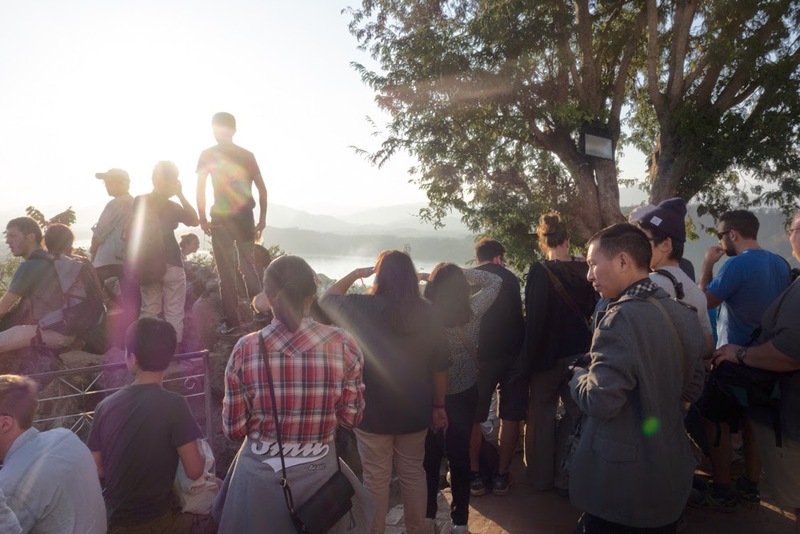 Laos was the only country in Asia where I really, really felt like a tourist. Now, I have no illusions about me walking through the streets of any Asian country and passing as a local. Being a white woman makes that impossible. I also don’t harbor many illusions about trying to pass as an expat. Not in shorts and sneakers at least. I accept that I am a tourist. A visitor. A guest. I came prepared knowing that I may be sold to or treated as a tourist. But in no country did I feel more annoyed and ashamed of my tourist-identity than Laos. Maybe this was just my experience. Other foreigners looked like they were enjoying themselves. But I hated Luang Prabang. The only time in which a Lao person would speak to me or even acknowledge my presence was to sell some good or service to me. Let me clarify: I do not feel entitled to anyone’s conversation or kindness. I do not expect total strangers to be interested in me, let alone want to converse with me on a personal level. If this happens, it’s wonderful and I cherish it. But for the most part, I expect strangers not to care about me. But in Luang Prabang I was offended. Not because strangers didn’t want to be my friend, but because they didn’t even see me as human. They saw me as a walking wallet. Every interaction was a transaction. I understand that there are linguistic barriers, and that people have a job to do and this is their livelihood. But seriously. Leave. Me. Alone. It was so hard to go about my day, not merely as a tourist but as a person, without being sold to relentlessly. Another annoying thing about Luang Prabang is that every worthwhile attraction comes at a price. Unlike temples in Thailand, Lao temples charge a fee of 20,000. This is way to much money when you consider the fees that are charged for other attractions and museums. In Myanmar, we also paid to enter the pagodas, but you could see that an enormous amount of money was required to maintain these structures, so I didn’t feel bad paying to see them. 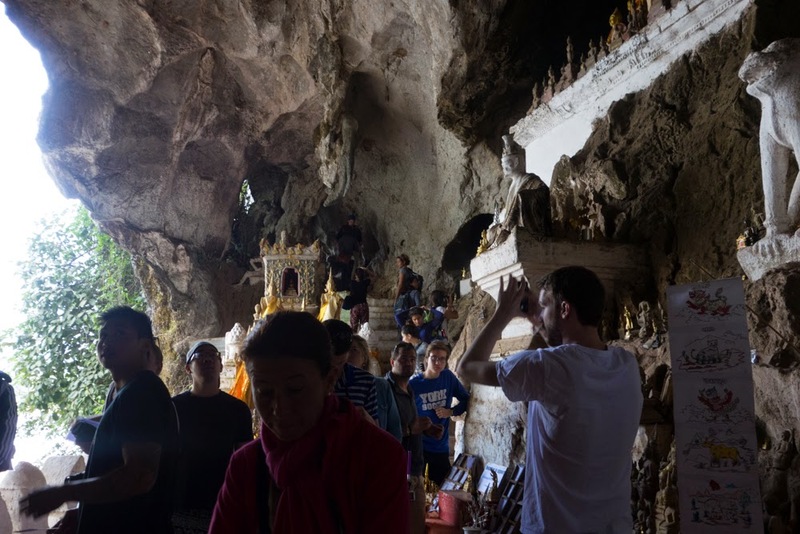 But in Luang Prabang the structures are not specially maintained, the fee is designed solely for the purpose of extract money from tourists, which seems to be the sole purpose for the town’s existence. As if it were not bad enough that you have to pay to enter Phousai mountain or a temple, there are people who await you inside asking for even more of your money! Ever temple and tourist sight has vendors peddling goods. This gets really annoying, because in most cases, they have you trapped. On the street you can walk away and act like you’re in a hurry, but at a temple or monument, they know you are here to stay. But the worst thing about Luang Prabang is, by far, the tourists themselves. The comes not as singles or pairs, but in droves. Groups of ten and twenty. They also do very predictable things. If the guidebook mentions it, you can be sure to see dozens, if not hundreds, of people doing it. Like watching the sunset from Mt. Phousi. Too many tourists mean that only photographs you will be taking, are going to be of other tourists’ arms taking photographs. What is supposed to be serene has become a spectacle. Everything has huge lines and crowds of blubbering idiots. It’s like going to the mall before Christmas on a day when everything is on sale. Absolutely horrid. Before coming here I read the article Elizabeth Gilbert wrote about Luang Prabang. A place “more conjured than constructed.” She said she would never go back for fear of tarnishing her memory of the place. Well, don’t go back Elizabeth, I certainly never will.